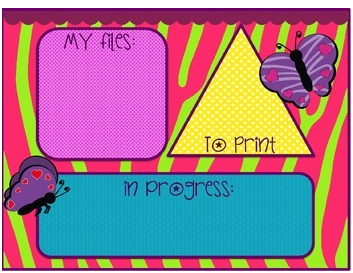 Pinkadots Elementary : Organization, bright colors, butterflies, & FREE.. What more is there to want in life? Organization, bright colors, butterflies, & FREE.. What more is there to want in life? I am stopping in really quick to show you my newest love, my bright desktop! Since we are currently under two feet of snow and getting more on Tuesday, I needed something colorful in my life. I figured I could start with my computer. My friend over at Mrs. 3rd Grade posted her adorable new desktop background on Instagram and I was inspired. Very cute! I love, love, love butterflies!! !